The Rapala Dives-To series casts like a bullet, and the farther the cast, the longer the bait stays in the strike zone. 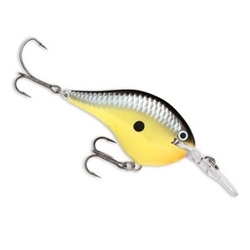 These crankbaits are made of Premium Balsa Wood and have a Custom Extra Thin Polycarbonate Lip. The DT Series features an Internal Rattle Chamber and VMC Black Nickel Round Bend Treble Hooks. With a Quick-Diving Resting Position and Side-to-Side Hard Action, the Targeted Species, are Multi-Species Freshwater Gamefish. The DT Crankbaits are the most effective way to cover more productive water and ultimately catch more fish!